Forgetting doctor appointments is a thing of the past with the new Medical Appointment Reminder template. The free document is a pre-made sheet that allows you to organize and list the details of your upcoming doctor’s appointments so you are exactly where you need to be at the right time. This free sheet is easy to customize and even easier to print. 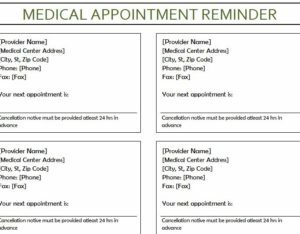 If you’re ready to stop paying fees for missed appointments and dealing with the hassle of rescheduling another visit, just read the instructions below to learn how to download and use the Medical Appointment Reminder template. This template is all about customization, but before you even get started, you’ll have to download the free template directly to your computer. Just follow the link below to get started on that. Once you have your document, you’ll want to change some of the stock information so you don’t have to enter the same address or other contact information over and over again. In the bracketed areas of this document, you will change this information to list your doctor’s contact information and only need to update this information if your doctor moves or you switch physicians. Now, here you need to make a decision, you can either print the sheet now, leaving the space below blank or you can enter the appointment date than print your document. Either way, to print the document, just click the “File” button at the top of the page and select “Print” to bring up the print options menu. When you have confirmed an appointment with your doctor’s office you will either write or enter the date in the indicated space. You can even add the cancellation or appointment policies of your doctor’s office in the small space at the bottom of the template to remind you if there are any rule/consequences to cancelling an appointment. Now you have everything you need to get to your doctor on time!